Winter camping Zion could be one of the most memorable trips that you will ever take and Lost Campers would love to get you there. 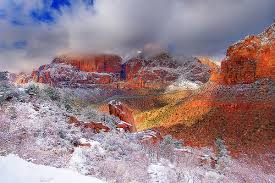 For most people the thought of camping during winter does not even cross their mind, but this is why winter camping Zion is such an excellent idea. Less tourists gives you the opportunity to enjoy the solitude of one of the most beautiful places on earth! The mild desert winters make camping is totally doable, especially with a campervan rental that will keep you off the ground, warm and dry. 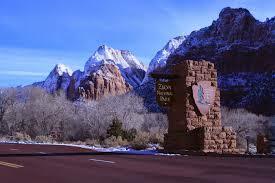 Here is some great information to plan your winter camping Zion trip. Are there campgrounds open during winter? Absolutely. Watchman campground in Zion is open year around and offers first come first serve campsites November thru March. Here is a nice winter camping hack for the campervan; This campground also offers sites with electric hookups that would allow you to plug in an electric heater with an extension cord that you can utilize at night to stay warm. We often have these complimentary heaters available at our depots to send with you, but if we are out of stock you can find them at most box stores for around $20. Watchman also offers bathrooms, drinking water, picnic tables and fire grates. Electric sites cost $18 per night. Due to the high traffic from April thru October you are not allowed to drive your own vehicle through Zion along the Zion-Mt. Carmel Highway (State Road 9). Zion has a fantastic shuttle that transports visitors throughout the park. The system is really great and definitely helps the environment, but it does not run November thru March. During the winter months you have an opportunity to set your own pace and drive a campervan along this scenic route. It is always a good idea to purchase snow chains for travel during the winter months as winter storms may make for snowy and icy road conditions. National park roads will require snow chains to drive there if the weather calls for it. The Zion Mt. Carmel Highway is plowed and sanded following winter storms, but Kolob Terrace road is not plowed, therefore it is closed during the winter months. Hiking Zion during winter is amazing. Many trails may not have much sun exposure during the winter months so they may have some ice or snow and possibly mud, but nothing that some waterproof boots and crampons cannot handle. The trails are virtually empty and the peaceful beauty is euphoric to experience. There are loads of photo opportunities during this time of year with the red sandstone, blue skies and white snow caps you are sure to take some framers. Most of the park trails are open year round, but a visit to the visitors center to enquire about trail and weather conditions is always recommended before you embark on any winter hike. For more information: Here is one of my favorite websites all about Zion National Park by locals who frequent there regularly. Your winter camping Zion adventure awaits you and a Lost Campers campervan can get you there! Submitted by Launi Haygood- winter camping Zion campervan fan!